Start with an overview of alloys and materials selection, and then, take a bar of high carbon steel and learn the basics of, forging, layout, heat treating, handle preparation, grinding, final assembly, and sharpening your blade. 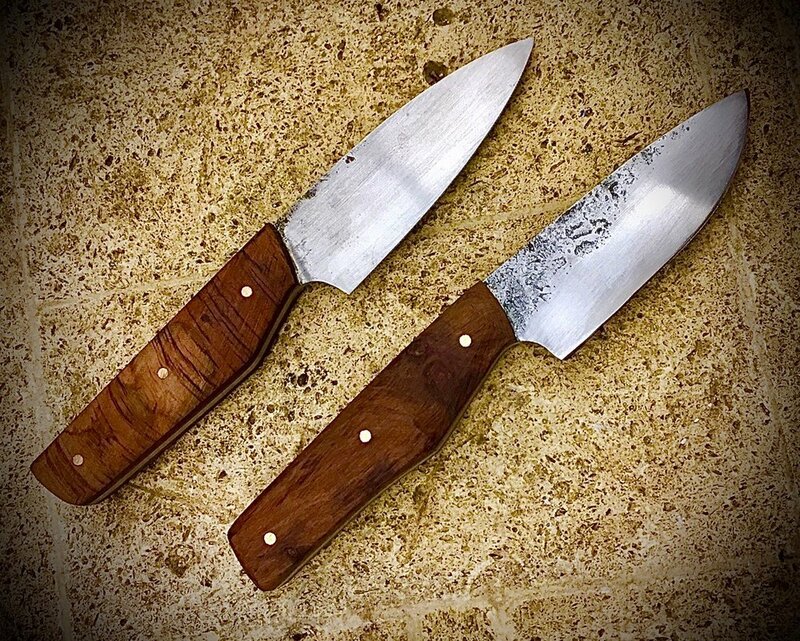 This workshop is suitable for anyone from the beginner, to someone who has some forging skills, and wants to learn to craft a simple "brut de forge" style blade. Class size is limited to six. In this two day workshop, you will make a 6" chef's knife using stock removal techniques. Starting with a profiled high carbon steel blank, you will learn about design & layout, differential heat treating, grinding, Handle selection, profiling, edge geometry, and more. Each participant will walk away with a knife that will be ready to go to work for you. Class size is limited to four participants. Come learn to forge a small axe suitable for camping, backcountry, wood carving, or splitting kindling at home. In this workshop you will start with a billet of high carbon steel, and learn about preparation, controlled hand forging, striking, punching, drifting, heat treating, sharpening, shaping and hafting a handle, and more. This is a physically demanding class, and not for the timid. Class size is limited to four. Forging experience is helpful, but not required. Stay tuned for upcoming class listings! In this class, you will take a billet of pattern welded steel (Damascus) and for it in to an axe. You will apply all of the same techniques that are learned in the regular axe making class, but you will also learn how to forge / work with and finish a Damascus piece. Stay tuned for changes and additions to this schedule, or ask to be added to our email list. Unless otherwise noted, all classes are taught by David Tuthill in his Ballard Forging studio. Reservations are first come first serve through this site. Keep your eyes open for a variety of upcoming classes. We understand that life happens, and sometimes things come up that are beyond our control. If you need to cancel your class, please notify us as soon as possible. A 30 day notice is required in order to receive a full refund, and up until two weeks before class, a 50% refund will be issued. anything after that is forfeit. Thank you.